Man I really shouldn't have taken this on without first knowing what I wanted to do well really how to do it. I have the attention span of toddler on a sugar high and I also like to plan things out before getting on it. I really should have waited until I had the plan before announcing this project because I kept you all waiting (sorry really sorry) and i hope, I pray, you all haven't lost interest in this. With all the continued controversy and drama surrounding the drama, all the actors need to feel the love and support right now. The above is the plan, and some kind, sweet, dear, volunteers are needed for each page. Page 2: I just need someone to make a nice collage of Seol pictures (sort of how you would see it on tumblr or on instagram) I have no photoshop skills so anyone who can put together a nice couple of Seol pictures? Page 4: I was hoping that @gerimisore you would be willing to let us use one or two of your old Seol fanarts or JungSeol fanarts? Anyone who has some kind of photoshop or whatever skills and wants to make like a nice banner or picture college or something let me know. Page 5: I was hoping @NRGchick and @Ahpheng could please do two comic each related to Seol (guest starting Jung or other characters) for it please? Page 6: already covered. Thank you all for the messages and keep them coming. Back Cover: @mgicc would you mind making something similar to the cover pictures using the official poster picture of Hong Seol please? If those I suggested to do something, are willing or able to do it. Please inbox me or drop a message here that yes you can do it or no you cannot. Please let me know by 3/15 8pm Eastern US time. For everyone else if there is a page or something you are interested in doing. Please in box me or drop a response her with the page number you would like to work on. Once I know who wants to do what. Some deadlines can be set (deadline, I feel like a business woman LOL) because I really want to get all of this done by March 30th or the first week of April. After then I know I will be hella busy back at work/internship and will regret ever thinking of this. @MrsSoJiSub 2 comics ? sure . any suggestion on theme ? would you like to use some of my old strips but they are all CITT related. i will send my fan message by end of today. Hi Kim Go Eun. Thank you for portraying the role of Seol so brilliantly! Words cannot express how exciting it was for me, as a fan of the original webtoon, to see you bring Seol to life. For being our amazing Seol, thank you! I hope the best for your future projects and career! Do we need a username and country like PHJ's? @Ahpheng thank you so much. two comic are yours. now themes...the first could it be a spazzing Seol scene (the one with multiple Seol's after she says yes to dating sunbae or the one where she meets up with Euntake and Bora and freaks out and confesses that she is dating sunbae but doesn't know what to do). I want those Seol's and characters as well to comment on how awesome KGE is in like a joking meta sort of way and how much they like her as Seol because she is Seol and off course sunbae likes her too. But she's confused because who is KGE....the second can be whatever funny thing like the boys (Jung and Inho) admiring how awesome Seol is and Seol off course choosing sunbae in the end. Actually I really liked your old comic I think it had Park Bo Gum in it. I'll look on your instagram but whatever you want to use or come up with is fine. I can help with comics or the fan messages. Like I mentioned before I can add them to pictures of Seol (similar to what I have done for PHJ). Watching you portraying Hong Seol is like watching the Web-toon came to live. After watching you I couldn't bring myself to think of any artist who fit it into the roles like you do. Thanks & will support you always. @MrsSoJiSub is this ok ? I will post this on my IG but let me know if you prefer that I do so after you've sent out the photobook . is this the strip you meant with Bogummy ? Let me know if you need more . Glad to help. @MrsSoJiSub OMG, yes! I'd be glad to. You can use my old Seol or Jungseol fanarts. But I don't think I can make a new one at the moment. When is the deadline? For the fanart? In case I have a little time to make a simple painting of Seol. Just let me know which one that you want to use and I can send you bigger file than the one I uploaded here (it'll be printed, right?). 김고은씨께, 나는 치즈 인 더 트랩에서 홍설을 연기한 당신을 좋아합니다. 당신은 연기에 타고난 재능이 있고 생기 있으며 사랑스러워요. 당신과 함께 웃고 울었습니다. 홍설 역을 맡아줘서 고마워요. 앞으로 좋은 일들이 가득하길 바라고, 곧 드라마에서 다시 보고싶어요. 화이팅. 말레이시아 싱가포르에서 Ahpheng 드림. 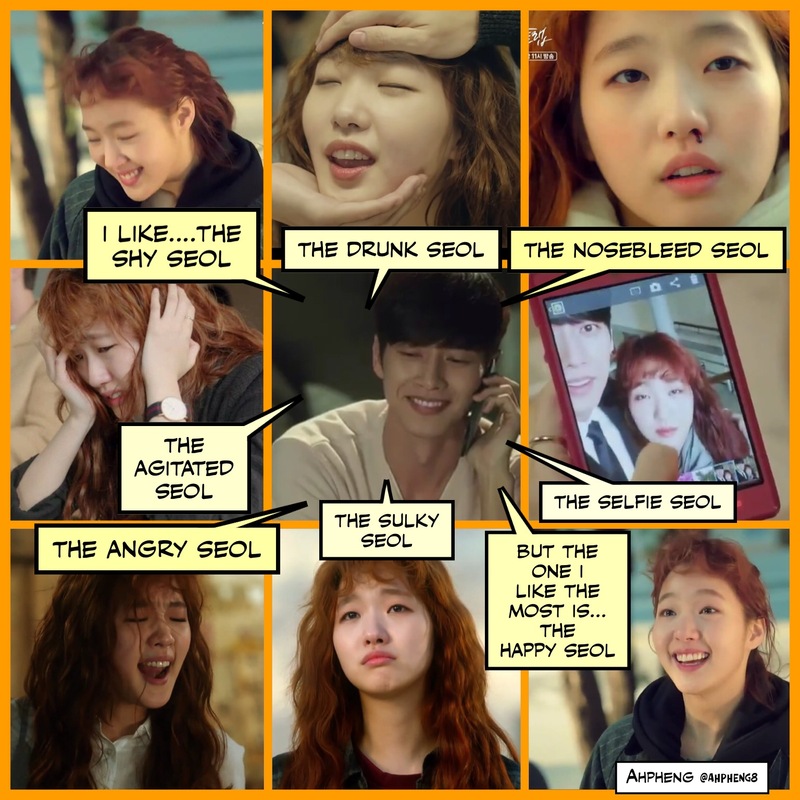 Thank you for your portrayal of Seol in Cheese In The Trap. You acted so well, I could relate to every emotion that you expressed. When Yoo Jung sunbae broke up with Seol, I felt my heart break as well as I watched you cry. I will continue to support you in your future projects and fighting! @MrsSoJiSub I'm so sorry, i'm going to write it this evening - I'm so busy. Thank you for reminding me that! Thank you for such a wonderful portrayal of Hong Seol. Watching you act is my pleasure because you played it so well. I'll be always cheering for you and I'm definitely looking forward to your future projects and I'm hoping to see you again in a drama. P.S. You look really good with Yoo Jung sunbae! @MrsSoJiSub I can help with the collage, but is there a deadline date. I want to make sure I have some spree free time to make it since I have school and work. And maybe some details on the template/dimension so I can make it the right size so it doesn't look distorted when printed. I am sorry that I only could contribute in support massage, could prayer for the success count? hehehe. I really impressed with your acting, I love your Hong Seoul, she is so dear in my heart, nomu kiyopta. Hope best journey for your life. Oh and always stay healthy, dear. P.S. I lost count on how many I repeat this drama. But, jeongmall, you look really good with Yoo Jung sunbae! 안녕하세요! 저는 루마니아에 사는 김고은 씨 팬이에요. 최근에 김고은 씨 나오는 드라마를 「치즈 인 더 트랩」정말 재미있게 봤어요. 항상 이렇게 좋은 드라마와 멋진 영화로 우리를 즐겁게 해줘서 감사합니다! 언제나 이런 모습이 변치하지 않았으면 좋겠어요. 촬영활동과 생활도 언제나 좋은 일들이 있기를 바랄게요! 항상 미소를 지으세요! ～「많이 많이 웃어라 성공할 것이다」~ 화이팅! Bless you above 6 for volunteering to do this with me. You do not know how grateful I am because I have quickly come to realize I am the worst person to do something like this LOL I swear I only know the very very very basics of the computer world and bless whomever invented google because I have been googling things like "what are dimensions" "how to setup a layout?" sizes and all that all week. I have update the first page with dimensions and due dates. I also plan to PM you all with this because that works much easier for me than having to check this page all the time. But I will update here and then PM you guys again. First I want to know, do the due date of 3/25/16 8 pm Eastern US time work for you all? I think that is about a week from now. If this is too soon, please let me know and I will push it back. I want to get it all put together and printed by April 2 or 3rd a the latest because after that I am back to nowhereville Kentucky for my internship and will not be able to have it printed. @Ahpheng thank you so much for the comic. I love the first and there is just too much PBG in the second for my liking (sorry still not over him being the husband kidding he is too cute and precious not to love) would it be fine with you if I look at your instagram for the one comic I am thinking of (I swear there was a shirtless PHJ in it) and then i'll let you know so you could size it the same as the awesome first one? Is that fine with you? @gerimisore no need to make new fanart. I know you are busy with shipper contest things. would it be fine with you also if I looked on your instagram and chose the Seol drawings to be used and then if you okay my using it would you mind maybe resizing some of them if possible? The real problem is that I am kind of in love with all your arts and having a bit of a problem choosing a few and not all. @NRGchick I am going to PM you the message I have gotten so far now. I just got to google how to get Korean characters to show up on word (told you guys I was dumb with this stuff) and then I shall send it to you. @sashalove would you mind doing p 3. Seol top 5 moments with pictures please? No one has volunteered yet (anyone who wants to do it please let me know) it would be nice if you could. However if you can't and no one volunteers soon. I shall do it along with the character analysis. Again a thousand and 500 and 1 thank you guys for working with me on this. Thank you thank you thank you so much to everyone who has sent in messages so far. @MrsSoJiSub fine with me, just look thru my IG and let me know which one, if it has shirless PHJ, could it be this one with nosebleed Seol ! Testing. I think that shorter messages are better so if Selina is reading this, would you like to shorten your message?